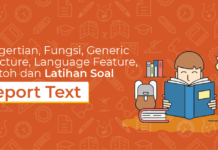 Di bawah ini merupakan penggunaan preposisi In, On, dan At dalam bahasa Inggris lengkap dengan contoh kalimat dan latihan soalnya. – Your socks are in the drawer. – His birthday is in January. – Claire will begin class in 2019. – We arrived at the airport in time to eat before the plane left. – The children were warned not to play in the street. – I have a dental appointment in the morning, but I will be free in the afternoon. – In the past, attendance at school was not compulsory, but it is today. – Everyone seemed unfriendly in the beginning, but in the end everyone made friends. – He could not park his car in the driveway because another car was in the way. – Once in a while, we eat dinner in a Chinese restaurant. – Clark finished his assignment in no time at all. – We start school in several weeks, but in the meantime, we can take a trip. – Emily stood in the middle of the room looking for her friend. – My brother was in the army for ten years. – We are going to sit in the tenth row of the auditorium. – I will give you the key to the house so you’ll have it in case I arrive a little late. (get) in touch with, (get) in contact with. – It’s very difficult to get in touch with Yerry because she works all day. – The books are on the table. – I will call you on Thrusday. – It’s too late to see Ema; she is already on the plane. – Kent lives on 16th Avenue. – Kent lives on the fifteenth floor of that building. 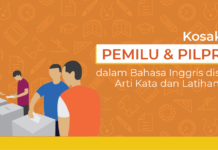 Digunakan untuk menyatakan lokasi yang umum. – Emma is at the bank. – Kent lives at 712 16th Avenue. – The class begins at 13.00. 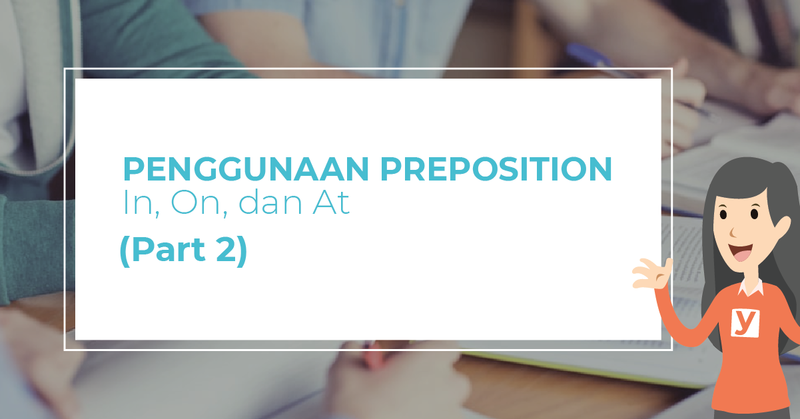 Nah sekarang kamu sudah tau penggunaan dari preposisi in, on, dan at. Untuk memahaminya lebih baik lagi, kerjakan latihan soal di bawah ini. 2. Will you be ____ home tomorrow afternoon? 4. It’s difficult to carry a lot of things ____ a bicycle. 5. Ellena is studying law ____ university. 6. My brother and I had drinks ____ the hotel balcony. 7. Munich is a large city ____ the south of Germany. 8. I think I heard the doorbell. There’s somebody ____ the door. 9. Charlie is _____ hospital. He is going to have an operation tomorrow. Jika ada pertanyaan silakan tuliskan pada kolom komentar.